Christiansted, the capital of the Danish West Indies from 1755 to 1871, is one of two main towns on St. Croix. Located between a busy seaport and green hillsides, the town is well known for it’s many historic yellow buildings. 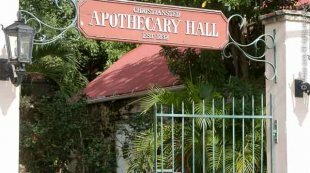 The one square mile town of Christiansted offers you a unique opportunity to visit a historically important town as well as to partake in shopping and dining in a modern setting. Christiansted has maintained it’s Danish architectural richness and offers many buildings and structures of interest, like cobblestone walkways, old churches and imposing fort Christiansvaen. The Christiansted historical area encompasses about 27 acres and is maintained by the United States National Park Service. It is located along the Christiansted waterfront and it includes what used to be a busy Danish business and trading center. It was once the area used to dock ships carrying human cargo, rum and molasses bound for the triangular trade route through the Caribbean to Europe and Africa. Christiansted is a very interesting town and well worth exploring.